Our December issue celebrates the 2016 Best of the Okanagan award winners in the North, Central and South Okanagan. 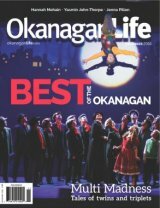 On the cover is the cast of Mary Poppins, performed this summer by the Kelowna Actors Studio, awarded Best Live Performing Arts Group in the Central Okanagan. We're seeing double with writer Patti Shales Lefkos as she delves into BC's multiple births. Wine writer Yvonne Turgeon raises a glass to a vintage year and we're in the kitchen with Chef Jenna Pillon of Hester Creek's Terrafina restaurant.